So simple and subtle. Unnoticed by an attacker, second nature to you and quickly activated. The alarm deters attackers or intruders but also functions to draw attention to you if, for example, you need medical attention or help. Traditional personal safety alarms are designed such that they need to be carried or sometimes clipped to a belt. The Wrist safety Alarm however is designed to be worn on the wrist and therefore can be very unobtrusive. The alarm can be worn either on the topside of your wrist or underneath in which fashion, it can hardly be noticed. 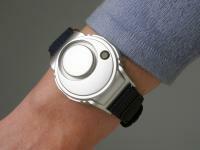 The Wrist Personal Alarm is a hands free system and gives personal safety protection without hindering any activity. The alarm can be easily attached and removed when no longer required, simply by tearing the Velcro apart. The strap is of such a length to be suitable for virtually all sizes of wrist. To activate the siren, simply press the button on the topside of the unit. To stop the alarm press the smaller button on the underside of the alarm. Simply remove two screws from the back case to give access to changing the batteries. We suggest that you test your alarm on a regular basis and particularly when you are using it. Only a short blast is required. If you notice any lessening of the sound, please follow the instructions above on how to change the batteries. Prolonged exposure to the siren may cause hearing loss.